You don't have to like football to enjoy tailgating! What is more fun than sharing good food with good friends? Join us for week #9 of Tailgating Time, I can't believe that it has already been nine weeks! Come on! it's easy, just add your link! It's all about the food!! Tailgating Time will be posted every Sunday at noon and it will be open until noon on Wednesday. That should still give you plenty of time to add your family favorites. We'll play each and every week until Superbowl Sunday. Can't wait to see what you bring! 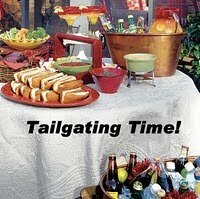 Would you like to be a host of Tailgating Time too? Leave me a comment with your email so I can let Martha know and she'll send you the code and add you to the host list - more exposure, more links, more football food, more fun! Hey Lyndsey, thanks for hosting, as always. Hope you're having a great weekend! Wow, another week to go! Time just flies, isn't it? 7 weeks untill X'mas! ha! ^_^ Hope you're going to have a great week ahead. I know you're busy, just stay calm & take it easy. And enjoy every moment of it. Brenda, thanks for commenting and you always add a great recipe to the tailgate party! Kristy, Thanks for linking up to TT! Can't wait to try your mooncakes! Thank you for all the encouragement too. I should take it from you...look how busy your schedule is. 3HT - Thanks for visiting! I'm trying to squeeze it in, without it looking like I am. Hi Lyndsey. I found your blog over at Brenda's Canadian Kitchen. My family loves football Sundays and we cook and eat all day long. I love your tailgating blog swap idea. You are a busy lady-thanks for hosting! Hi Rhondi, thanks for stopping by, and visiting our tailgating party! Hope you find some good recipes here! What a wonderful selection of delicious food. Too bad we dont do tailgaiting here in the UK! Une sélection de menus qui me plait beaucoup.